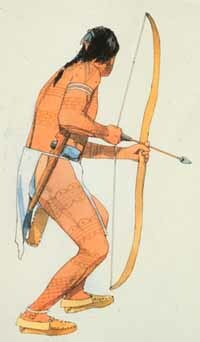 Artist's illustration of a Native American man with a bow and arrow. Armed with this new weapon, Late Woodland hunters had a more effective tool for killing game. Early and Middle Woodland people used the spear and atlatl as their principal weapon. About 1,400 years ago, Late Woodland people started using a new weapon, the bow and arrow. Archaeologists do not yet know where or exactly when the bow and arrow were invented. However, the advantages of the bow and arrow over the spear and atl atl suggest why it was invented. Imagine hunting white-tailed deer. Always wary, deer do not let people get too close. Armed with a hand-held spear, a hunter must move quite close to be within range. The snap of a single dry twig and the deer runs out of range. With an atlatl, the hunter does not need to be so close, but stalking the deer is still difficult, and it requires more room to maneuver. Together, the bow and arrow are more powerful, compact weapons. A hunter can accurately shoot an arrow from a greater distance and still penetrate the animal. It is not surprising that use of the bow and arrow spread quickly throughout North America.